This year 2018, there are lots and lots of competitions especially in the tech world. Every companies big or small are now offering extraordinary products that rivals the ones we are already used to for long. One interesting thing about this competition is that newer or smaller companies now offers nearly close or even better gadgets for a lesser price. That is a really big alarm that bigger companies and industry leaders should take not of. The Chuwi Lapbook Air 14.1 is a great example of such. While the Lapbook Air might not be as really powerful as other high-end Windows PC, it’s a very beautiful ultrabook that is flat enough to fit anywhere you want it. For so long, I’ve particularly longed for a better looking PC with most PCs all looking ugly or rather too large in their sizes. Something Dell is somehow known for. When the HP Spectre was released, it was as if that would be the end of ultra thin PCs but then the Chuwi Lapbook Air makes the competitors even more. While the Chuwi Lapbook isn’t the only Windows 10 PC rivaling the Apple Macbook Air in the terms of Design and external looks, others such as the Huawei Matebook, Jumper EZBook or even the AllDoCube Thinker are just few of the many ultra slim PCs in 2018. The device is powered by the Intel’s Apollo Lake N3450 processor, which is a new modern chipset though not in the realms of the Intel Core i7. It has a whooping 8GB and 128GB of Solid State Storage and also two USB 3.0 ports, a microSD Slot and Mini-HDMI-Out port. The screen is a 14.1 inche display with a very thin bezel unlike other large PC and that makes the device to being more beautiful. Despite the minimalistic and beautiful design the device has, it still has some extended Keyboard features like the dedicated Home, End, Pg Up and Pg Dn keys. The Keyboard sticks well out and it’s backlight is also cool. Even the Chuwi Logo lit from whenever the device is powered on. Chuwi…the nme might sound sort of strange to some who have all their lives being used to HP, Samsung etc. But this is a far east…Chinese company that manufactures computing gadgets like PCs, Desktop devices and Tablets. While that might be the reason for the cheap pricing of the device considering the fact that Chinese devices are usually cheaper than their US Based counterparts, one can argue that’s the only reason but well, that might not be. For example, the Chuwi Lapbook Air isn’t as powerful as the HP Spectre but the device is great for those that works lightly. 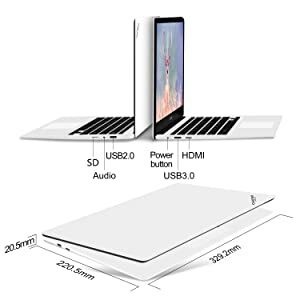 Let’s say you’re just going to be surfing the internet and then doing some very minimal tasks which aren’t excessive like playing some extremely graphic games or programming (LOL), then this is the right laptop for you. Another interesting thing about the PC is that the device is that you can add more SSD to the storage to increase performances and spaces. Really nice and really slim. The device might be your companion if you’d like something this slim. Yes of course. You should but like I’ve said earlier, if you’re not planning to do something extremely huge then this might be the right device for you else, you stick back with those huge and ugly Windows PCs. Since Chuwi, the company behind the Lapbook Air doesn’t have a significant presence overseas yet, it might not be a good idea if you’re not purchasing the device from a trustworthy outlet. For example, the device is sold on Amazon, Gearbest, Banggood and AliExpress, so shipping from oversea is going to be somewhat in the realms of snailmail if that sounds very slow to you. Unless you want to pay for faster shipping methods, the device is going to arrive in weeks and I’ve seen complaints of how long it took GearBest to deliver the product after waiting forever. It’s a really cheap Windows 10 PC sold around $350 – $450. That’s a lot of deductions especially if you’re to consider how much you’ll have to pay to get an Apple Macbook Air. There are some alternatives like the Jumper EZBook. There is also the Huawei Matebook which looks and feels like the Macbook Air. All these devices are firmly built and are durable in every senses just that the disadvantages when it comes to supports in case of accidental damages or returning the device might become nearly impossible especially considering the laws of importation in China. Although some vendors accepts returning and the processes of refunds might be another big problem. There is a thin protective layer on the screen of the Galaxy Fold, DO NOT REMOVE IT.